I mentioned my parents and I did a quick roadtrip to the beach earlier this week. Yes. The beach. Me. We went to Topsail Island for fish, first - of course, my pop has local fish guys. Then, we headed down to Wrightsville Beach and Wilmington. Seriously, ya'll. At WB, My dad made me get out of the van to go look at the water. I don't think he's read half of my beach-hate magnetposts, and still, he was like, you better get out of the car and see the Atlantic, while we're here. Of course, I went. And it was gorgeous. What? I only hate it when it's hot and sticky and sandy and crowded. And what's a trip to the beach without at least passing by a Waves surf shop. We never really went to them growing up. But, after I got my dad to turn the van around so I could get a good shot of the giant alligator facade, we stopped so I could pick up this little number. Though, off season, there's nothing sadder than a cavernous Waves, completely empty, but for the dude folding T-shirts at the counter, waiting for the 2011 season to begin. His face kinda fell, when I asked him where the magnets were, and I worry that my $2.99 would be the day's take. 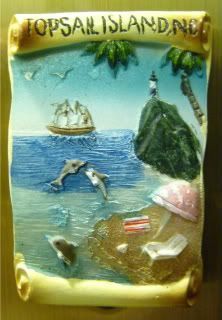 This one's definitely one of the tamer magnets. I saw some diiiirty magnets up in there. Like, who wants that junk on their fridge? I totally wanted to take a picture, but I don't even want to know the bots that would show up here if I did. Ew. But, it totally explains why my parents never really wanted us to drop by Waves when we were little. 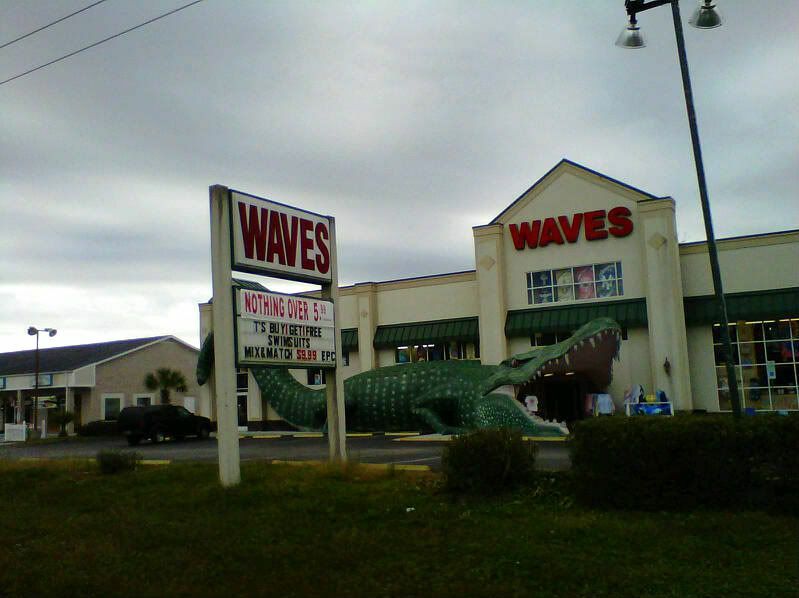 hahahahhaaha they have these in biloxi too, but they aren't called waves. but they are just as cheesy and gross and disturbing in what they carry for souvenirs. gross. I didn't even look at the rest of the store, I was just grossed out by the boobie/thongy Topsail Beach magnets, and then some of the stuff in the tchotchke aisles. Blech.